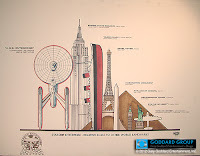 The Trek Collective: They almost built the Enterprise, full size, in Las Vegas!?! They almost built the Enterprise, full size, in Las Vegas!?! A couple of decades ago the people in downtown Las Vegas were looking for a new attraction. They eventually went for a big projected display thing apparently. But the original first choice was what would surely have been the most incredible Star Trek thing ever built; a full size real world replica of the movie era TOS Enterprise! The attraction would have included all the major rooms seen in the film, tours and rides, a big starfleet restaurant and such. It had a design team working on it for several months and was ready to get going. It would have been truly monumental (just look how it compares to other large buildings and monuments), and was surely a testament to power of Star Trek as a brand and cultural force then, and a way to cement its ongoing presence in the popular conscience. All that was left was to get it signed off by Paramount. The licensing team was enthusiastic, so it came down to one meeting with the president of Paramount, Stanley Jaffe. Carefully considering the huge source of ongoing revenue and the massive boost to the Star Trek brand that would continue for years, Mr Jaffe turned the offer down, because maybe it would have been a flop, and maybe it wouldn't have had the company and brand boosting effect expected. And so the whole idea was scraped! You can read and see more about this project on the Goddard Group blog, the company that worked on it. That attraction would have been amazing! I would have want to live in it!